This week we look at the irrational number π, and some methods for calculating it. 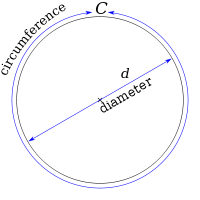 For a circle, the ratio of the square of its perimeter, P2, to its area A, is 4π. For all other shapes, P2 / A is greater than 4π. For example, for a square, P2 / A = 16. Through the ages, scholars have used simple rational approximations for pi, for example 22/7 or 25/8 or 3927/1250 or 355/113. 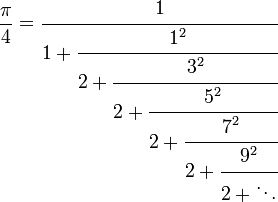 But π it is not equal to any fraction: it is an irrational number. This means that it has an infinite number of decimal digits, and the digits do not have a repeating pattern. The square root of 2 is also an irrational number. But unlike π, √2 is a solution to a polynomial equation with integer coefficients: x2 - 2 = 0. For this reason, √2 is called an algebraic number. By contrast, Pi is a transcendental number: it is not the solution to a polynomial equation with integer coefficients. Here e = 2.718281... is another irrational number (Euler's number, the base of the natural logarithm), and i is the unit imaginary number (which we encountered in last week's tutorial). π turned up rather unexpectedly in the the answer to Mini-Challenge #3 on Farey series. It is intriguing that π makes an appearance here, because Farey series are built from whole numbers, which seem to have little in common with circles and geometry. A proof of this final step can be found here. x2 + y2 < 1. This is an example of a Monte Carlo method. Such methods rely on repeated random sampling to obtain a numerical result. It is not a very efficient method. The error in the estimate decreases only slowly as we increase N, the number of points. print "Estimate of Pi using " + str(N) + " points:"
This code generates N = 1000 pairs of coordinates in the interval 0 < x < 1, 0 < y < 1. It counts how many of these have a length of less than one, and uses this to estimate π. To generate the coordinates, I'm using the random module, which implements various (pseudo-)random number generators. Here, the random() function returns the next random floating point number in the range [0.0, 1.0). Show that the error in the estimate decreases with 1/√N, where N is the number of sampling points. Write a Monte Carlo program to estimate the proportion of pairs of numbers which are relatively prime, and hence obtain an estimate for π. (First, read the "Pi in number theory" section, above). Archimedes drew a regular hexagon inside and outside a circle, as above, and then successively doubled the number of sides until he reached a 96-sided regular polygon. By calculating the perimeters of the polygons, he proved that 223/71 < π < 22/7. It is better known as the Leibniz formula for π (alternatively, the Gregory-Leibniz formula). To use the formula, we must truncate the series. The accuracy of the estimate depends strongly on the rate of convergence of the series. This series converges rather slowly. An approximation for the error in the estimate is given by the magnitude of the next term that has been omitted. So if we were to sum the first n terms, the error estimate would be 1/|2n+1|. A rather beautiful formula for Pi was found by Lord William Brouncker in the seventeenth century. Try increasing N, the number of terms in the continued fraction: how does the error in the estimate change? Now let's look at two efficient methods, which allow us to compute many digits of pi. To compute pi to very high precision, we will need to make use of a Python module: decimal. The former statements, using the standard "float" datatype, should be less accurate than the to the latter statements, using the "decimal" module. Machin's method is efficient because each term in the series for arctan(1/5) is a factor of at least 25 times smaller than the last. So for 100 digits of accuracy we need only k terms, where 25k = 10100 => k = 100 log(10)/log(25) ~ 72. An even more efficient method is the Gauss–Legendre algorithm. It is notable for being rapidly convergent, with only 25 iterations producing 45 million correct digits of π.
in order to find their arithmetic-geometric mean. The algorithm is quite simple, and is described here. A Python code for implementing the algorithm, making use of the decimal module, can be found on Stack Exchange (see the top-rated answer). I have attached a copy of the code for computing the first 1000 digits of pi at the bottom of this page (pi_gauss_legendre.py). Please try it for yourself. Web pages on calculating Pi using Python by Nick Craig-Wood. A book called "Pi Unleashed"